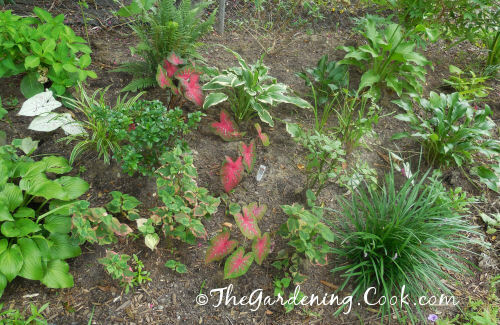 Trying to get color and interest in a shade garden can be a challenge. But there are some that don’t mind it at all . 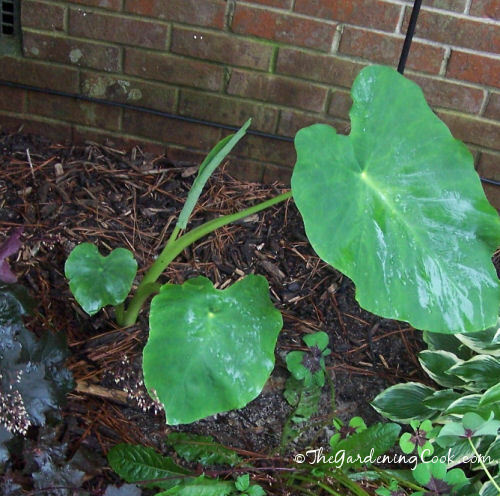 In fact, these 20+ perennial and annual plants love the shade. There is a lushness about them that I really enjoy, too. My shade garden is thriving. I planted this garden bed two years ago with the lasagne gardening technique. Basically I covered the sod with cardboard, added more sod (root side up) on top and then top dressed it with top soil.) It took about 2 months to kill all the old weeds and I just planted whatever I had to spare in there. Much of it languished and had to be moved because the area really is quite shady. Only about 1/3 of the bed gets even filtered afternoon light. The rest of the day, the bed in mainly in the shade. I don’t have a true before picture of this bed. I had cleaned it up quite a bit by the time I took this picture. This was taken in about March when the plants had just started growing well. I had transplanted several perennials that needed more sunlight by this time. The bed sits along a chain link fence (which I hate and wanted to hide) and also partly overlooked my storage area and potting area which is kind of untidy. So I needed something along the fence line to hide it and the view beyond it. I chose this rhododendron because it was a bargain ($14.99), because I love the flowers it will bear, and because it was big. It likes the shade of the Pin Elm tree above it and is growing nicely and hides a lot of the potting area behind it. The right side of the fence line that gets a bit more sunlight in the afternoon is home to this gorgeous butterfly bush. It does well here too. 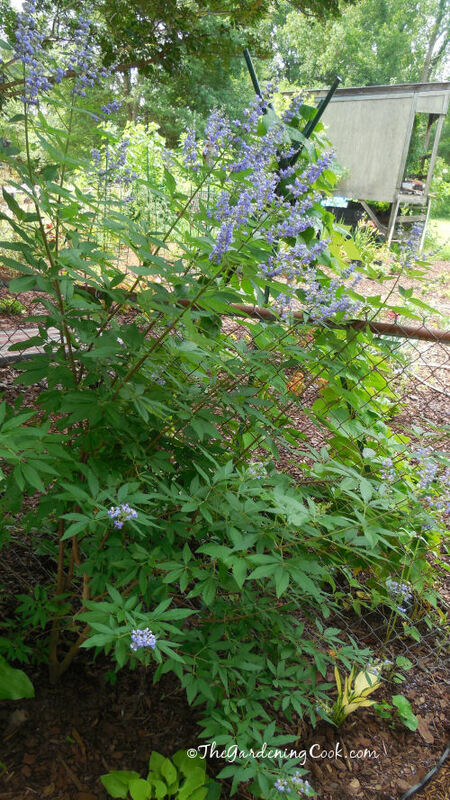 It is not as lush as my butterfly bushes in the sun, but has grown taller and the blooms are something else. Look at the size of this blossom! The bees just love it and it’s great at hiding the fence and also adding some blossom color to the bed which it needs. 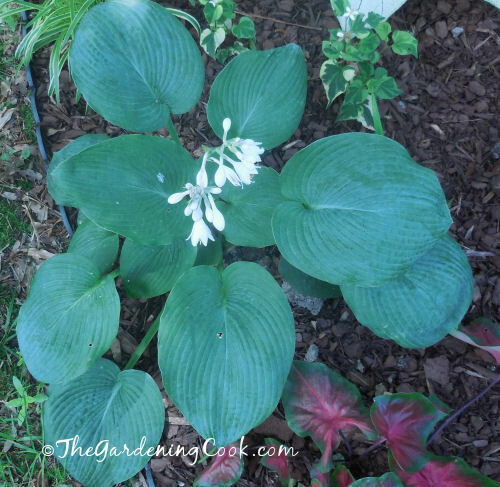 The striking pure white margins of this pretty hosta make it really pop in the garden. 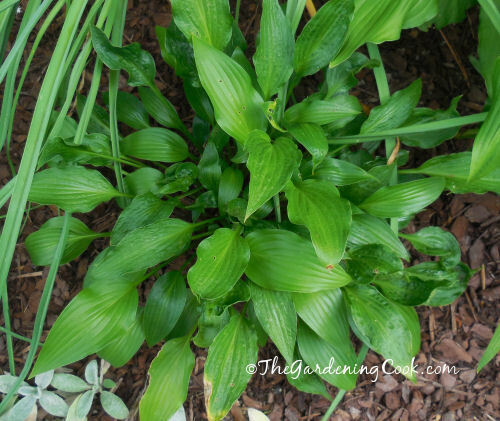 It is one of the earliest hostas to show up in my garden beds. 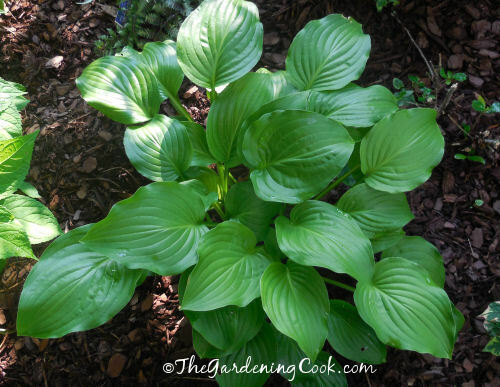 See my tips for growing Hosta Minuteman here. In the middle of the fence line is a Blue Salvia and also a smallish Old fashioned Bleeding heart. I previously killed my last bleeding heart by putting it in a shady part of a garden bed that gets afternoon sun. This one loves its new spot. It gets only a tiny bit of afternoon light and shade the rest of the day and is growing well. 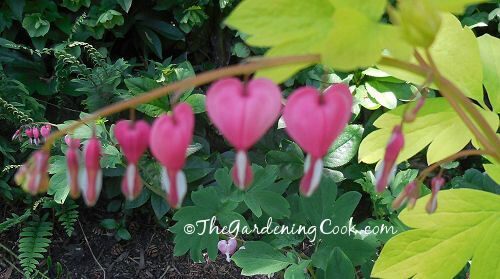 It is easy to see why it’s called a bleeding heart, isn’t it? 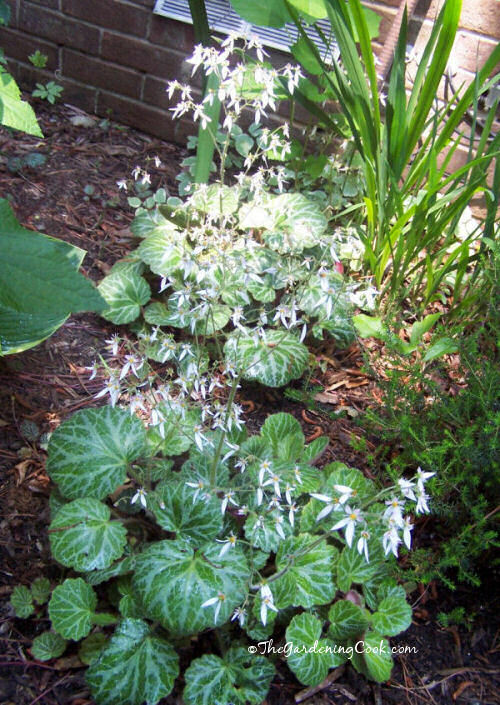 Begonias are a wonderful flowering plant that can be the real start of a shade garden. They are normally annuals but can be dug up in the fall to re-plant again in the spring. See my article on growing begonias here. 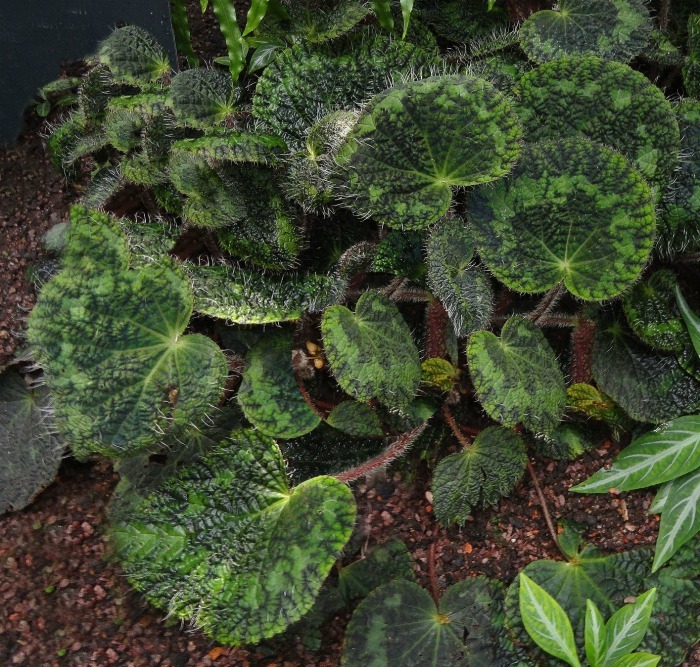 Many begonias have very interesting leaves and really showy flowers. 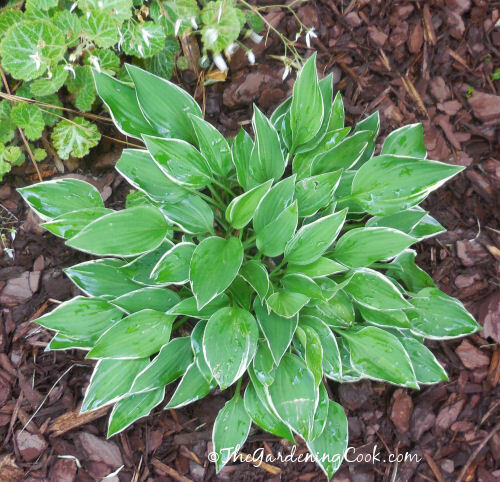 During this process, I discovered my love of hostas. Whenever I was out shopping, if I saw a variety I did not have (and it was on sale!) I snapped it up and planted it in this bed. 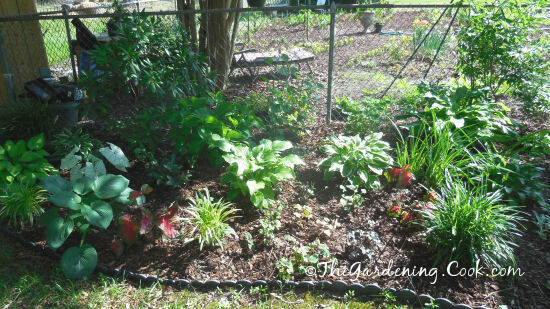 I have several varieties planted in this bed and in other shady areas of my garden. Most don’t like a lot of sun. *Disclaimer: Most of the following hosta pictures have names that I have had to research. 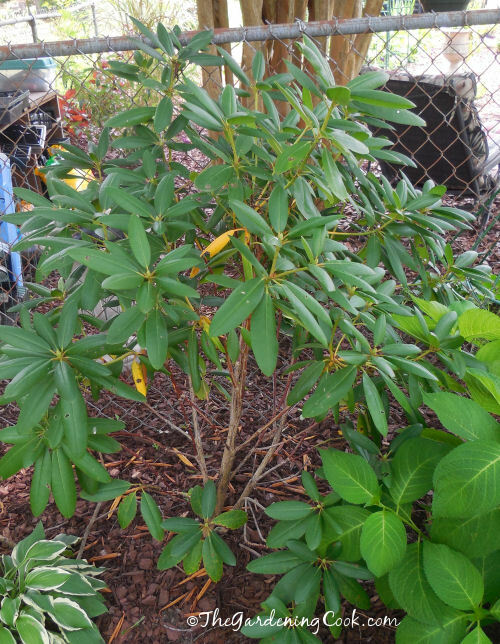 I buy many of my plants from back yard gardeners and they don’t often identify the plants. I believe these to be the correct names. If any readers notice mistakes, please let me know in the comments and I’ll make corrections. Thanks! This Hosta Albo Marginata loves the shade. 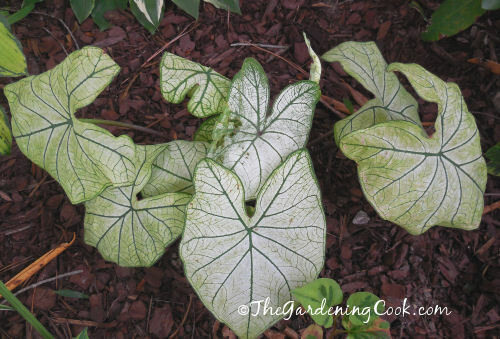 Even in quite full shade the dark green leaves have the white outer margins that give me the variegated look I love. My shade garden goes from a completely shaded area of the house around the house (which gets morning sun) and to the front which faces North and is almost completely in shade. This Blue Angel Hosta is on the north facing area and still flowers all summer long. 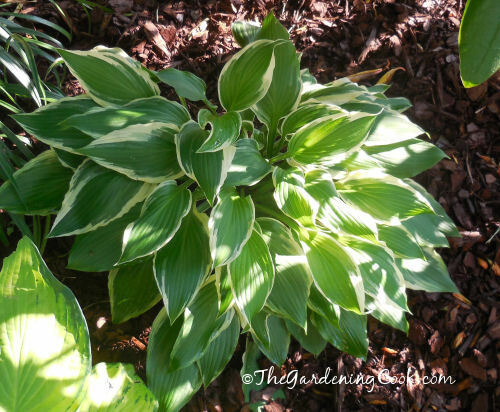 This Golden Nugget Hosta gets mainly shade all day long. The flowers that grow on a long stalk don’t mind. They are like tiny lilies. 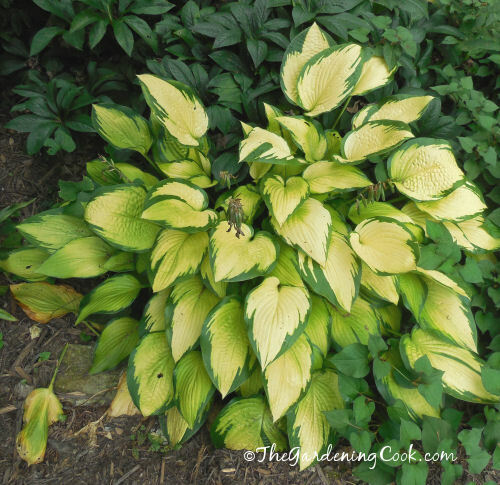 I love the muted colors of this Gold Standard Hosta. It is just getting ready to flower in this photo. 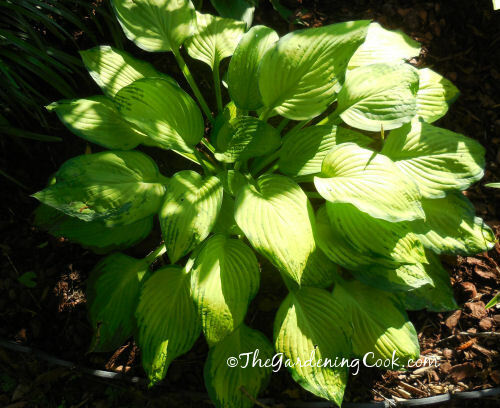 Hosta Crumb cake has pale green fluted leaves with slightly darker margins. It hasn’t flowered yet but seems to love its spot in the shade. Hosta Devon green has large fluted leaves that are all one color green. It sits in complete shade most of the day. Hosta Pixie Vamp gets a bit more filtered light in my garden bed. It has small green leaves with white margins. 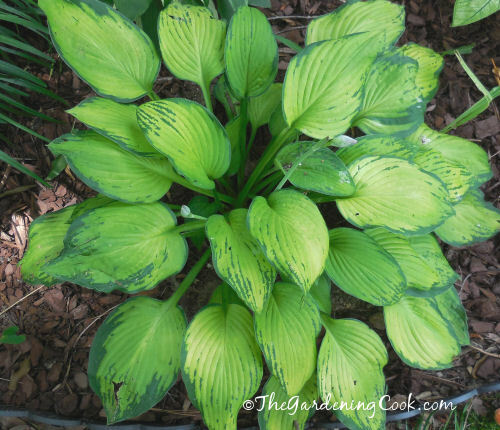 I have several of these Hosta Wylde Green Cream varieties in my beds. This one is the largest. I love the yellow centers with darker green margins. 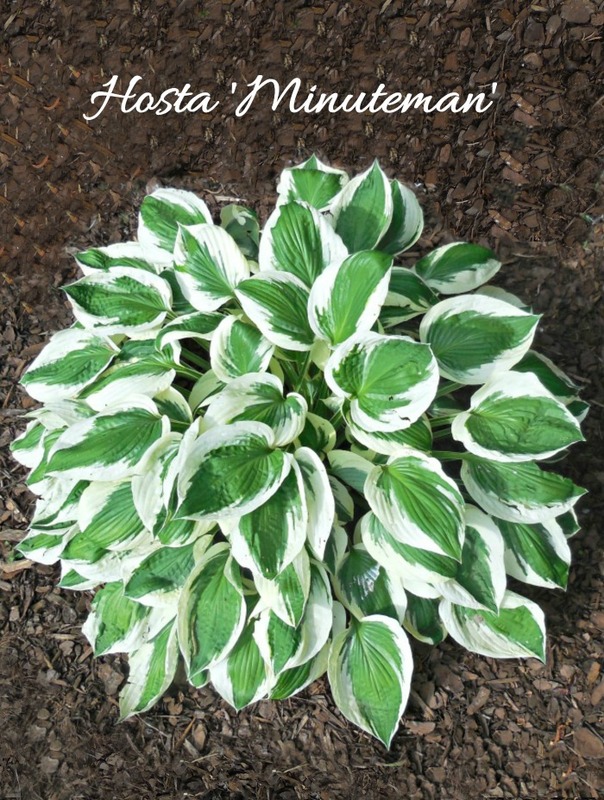 This Bride and groom hosta has leaves that curl on the edges as it matures. It stays a solid green color. 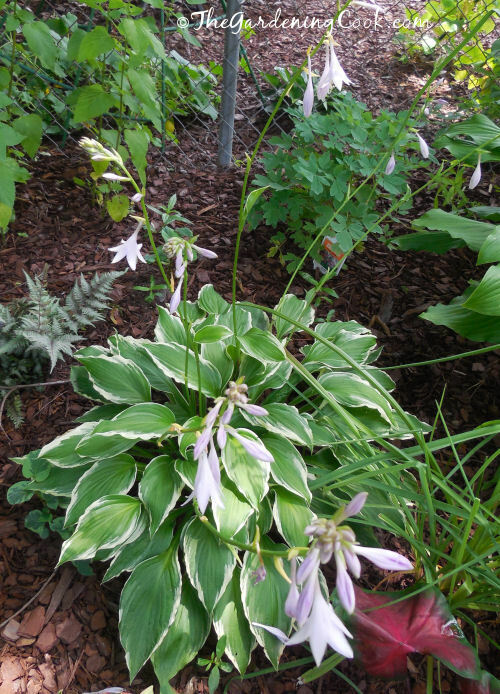 This Frosted Mouse Ears Hosta is one of my favorites and the largest in my garden bed. The leaves are about 6 inches wide now. 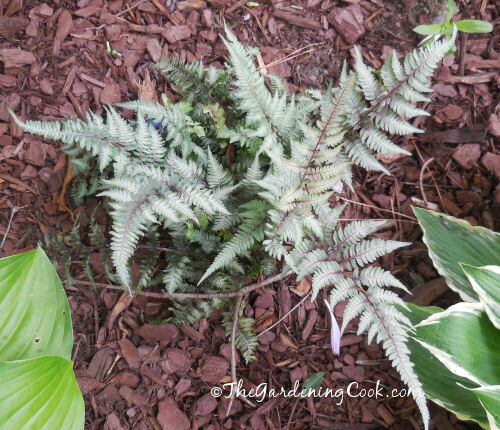 In addition to my hostas, I also have several ferns that love the shade. 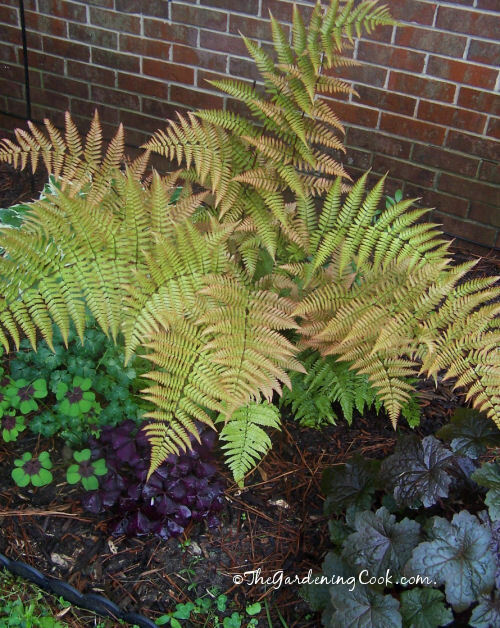 This Japanese Painted Fern, Regal Red has deep red veins and silvery gray green fronds. It is a new addition this year. It gets very light afternoon sun. This Ostrich fern is surrounded by oxalis and coral bells plants. It faces north and loves the shade. It starts out green and goes a golden color as the summer progresses. Mine is about 3 feet wide right now. I have three varieties of Oxalis. 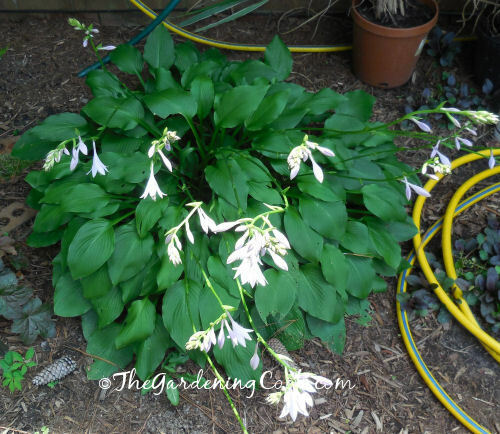 This shade loving bulb is so easy to grow and loves the shade. The bottom variety is a wild one that just appeared. I planted the top two varieties. 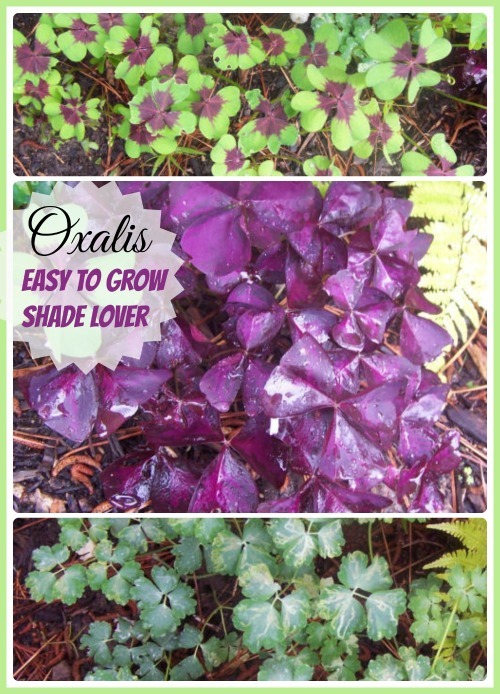 See my tips for growing oxalis here. Tiabella Heuchera (coral bells) is new to my garden this year. 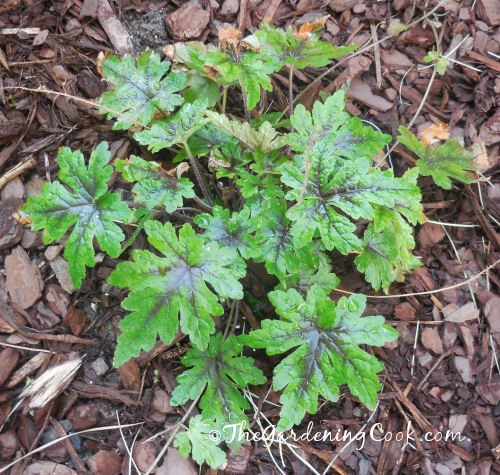 It has lovely dark veins in the center of the green leaves that remind me of an Iron Cross Begonia. It gets morning filtered light and afternoon shade. 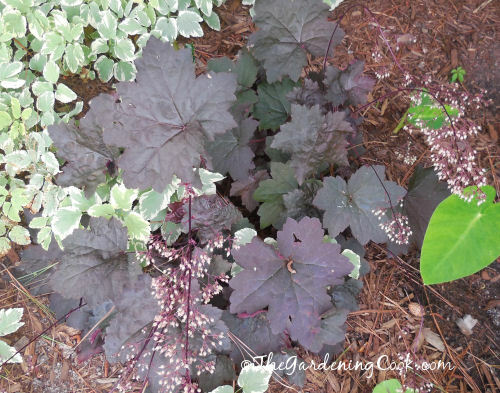 Coral bells are similar to astilbe which also loves the shade. It makes a wonderful companion plant since Astilbe gives the colorful flowers and coral bells give the color foliage. Heuchera Obsidia faces north and gets almost no direct sunlight. It still gives the tufts of pale pink flowers and gets bigger each year. This Monrovia Helloborus was my big purchase this year. 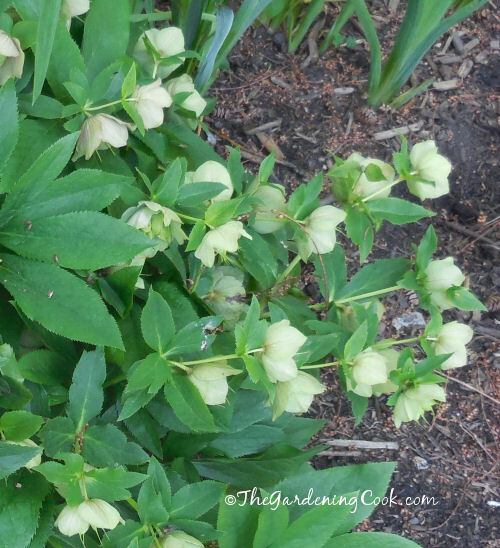 It is also called a Lenten Rose. I had been looking for it for years and the garden center had small ones for $16.99 so I snapped it up. That is a lot for me to pay for a small plant but I really wanted one. The reason for my desire is these flowers taken on a Hellebore at the Raleigh Rose Gardens. It is the first plant to flower each year, even when there is snow on the ground. My plants gets very filtered and really minor afternoon sun. The shadiest part of my border has both plain green liriope and liriope muscari variegata. Also called, Monkey grass, it’s easy to grow and has tufts of purple flowers in summer. I have several colors of Caladiums. They grow in both full shade and partial sun but don’t like full sun at all. They grow from tubers and must be dug up each fall or they will die. 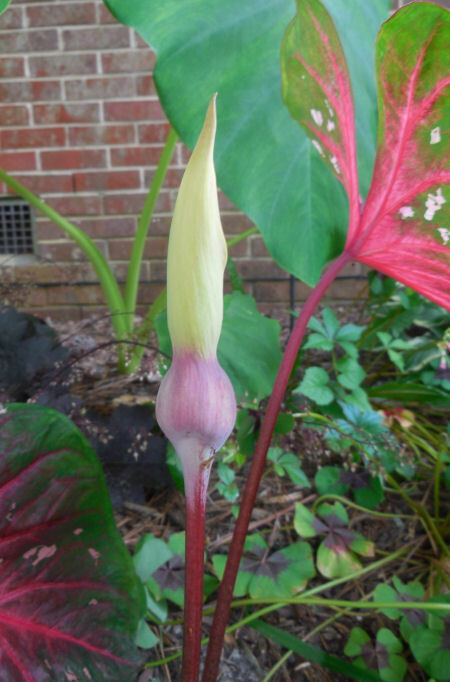 The flowers of caladiums are quite impressive. Not all of mine flower so it’s a real treat to see the stalk pop up above the plant. Rounding out my list of shade lovers are these strawberry begonias. They make a great ground cover. This batch gets light morning sun and shade the rest of the day. They over winter in 7b gardens and have very delicate stalks of white flowers above the plant. They send out offshoots that can be easily dug up to make more plants in other parts of your garden. This is the shadiest part of my garden bed. I have many borders but this one is my very favorite. I just love the lushness of it. Sometimes flowers aren’t really needed. Especially with plants that have leaves like these! 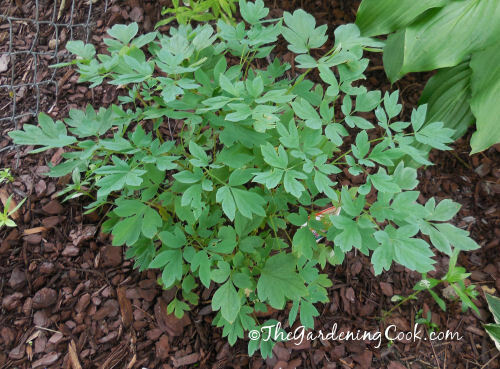 What have you found that grows well in your shade garden? Please leave your comments below. 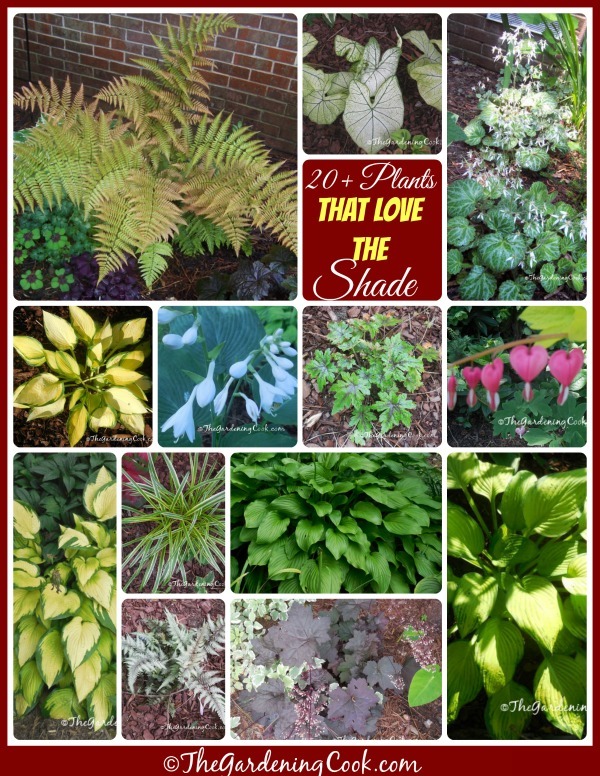 Great selection of shade plants. I have many of them in my shady north facing garden. 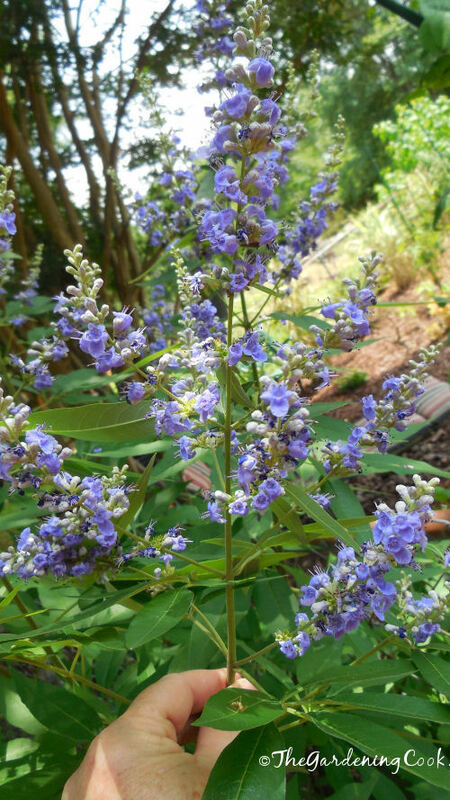 Try planting bugleweed. 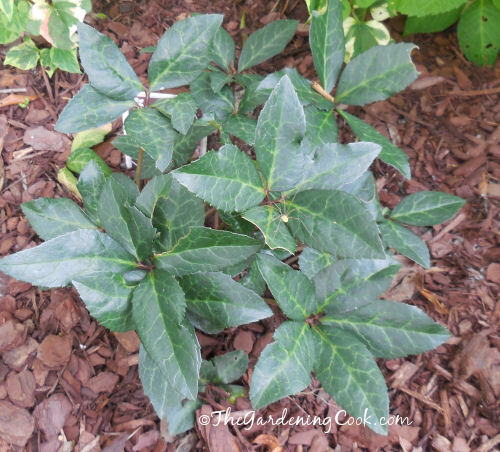 You will love it in your shade garden. The second year will blow you away.